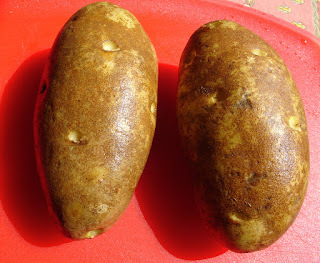 Mystery Lovers' Kitchen: Screwy Potatoes! Over the last two weeks I have tried four new recipes. Two from Facebook and two from the Internet. This is the only one that made the cut. How sad is that? And this is more of a technique than a recipe. I wasn't so very disappointed by the ones on Facebook. 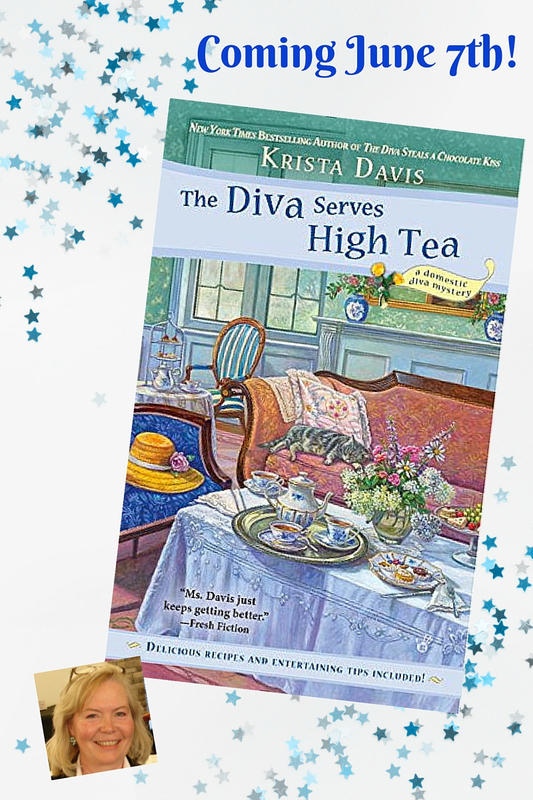 It's not exactly where one goes for great recipes. But one of the sources is (now was) one of my go-to spots for great recipes. I won't reveal which one it is so I'll simply warn you that cauliflower and mustard really do not go together. Don't even be tempted. As I mentioned, this is more of a technique but it's a good one. I think children would love this. There's just something very fun about spirals. It's a fresh and cute way to fix potatoes. But cutting them can be a little tricky so I don't recommend letting kids help prepare these. 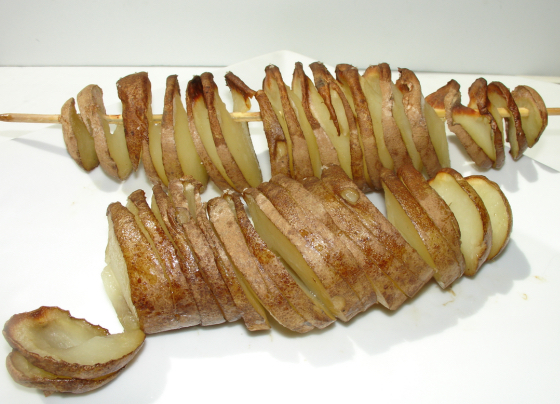 My one complaint was that while I used oil and salt on the potato, I thought it needed more seasoning. So take your time and make sure you get a good dose of salt or other seasoning inside the little spirals. Baking the potatoes is a snap. I added them to the pan of a turkey breast I was roasting at 400. 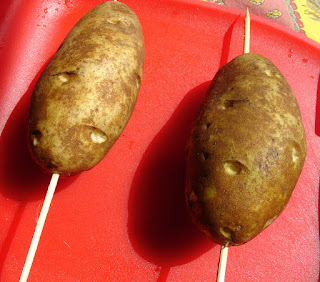 The skewers were long enough for the potatoes to hang in the air, although that's not necessary. An hour later, when I took out the potatoes, the skewers had buckled in the middle but the potatoes were still fine. Overall impression? These are more fun than they are gourmet, but worth sharing. Make them once, and I bet kids will ask for them! Preheat oven to 400. You can bake these with something else. I was roasting a turkey. They were cooked through at one hour, so plan accordingly on when to add them. 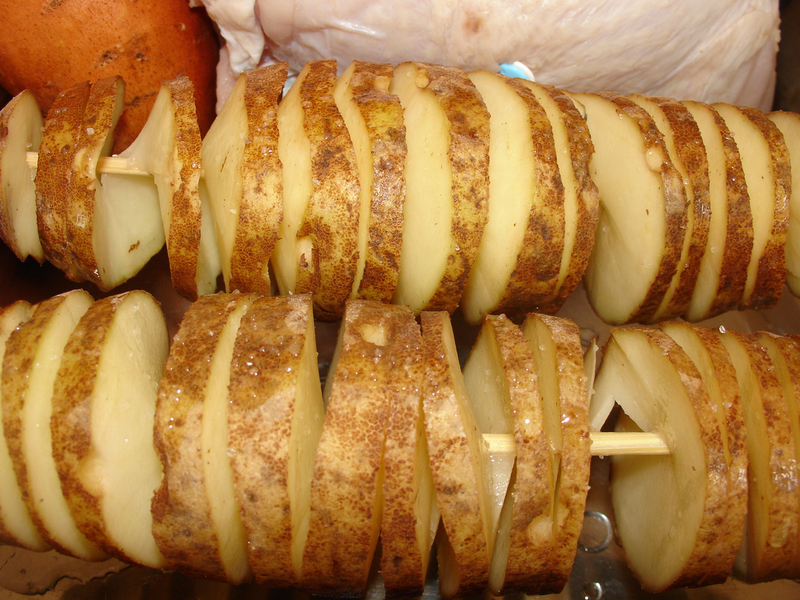 Press the skewers through the center of the potatoes lengthwise. One of mine slid right through, the other required amusing machinations. 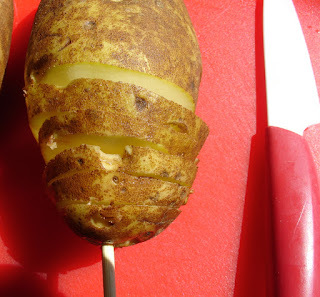 Start at either end and cut the potato on an angle, never completing the circle. The knife can go all the way through to the skewer. If you get too far off track, just make an adjustment and keep going. It's okay if they aren't perfect. Ordinary baking potatoes, eyes removed. Possibly the most difficult step was pressing the skewers through the potatoes. 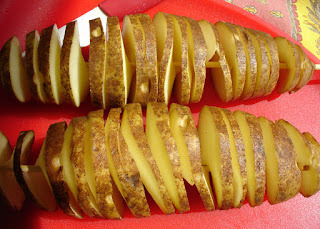 Start cutting on a slight angle and keep going through the entire potato. Done! As you can see, they're not perfect. That's okay. Sprinkle with oil and salt. Place in pan. This was not touching the turkey. Fun! They slide right off the skewer and onto a plate. I'm so glad you like them, Jen! I definitely like how these look. A great new technique to try. Thanks. They're fun, Mason. I hope your skewers go through easily! What fun! 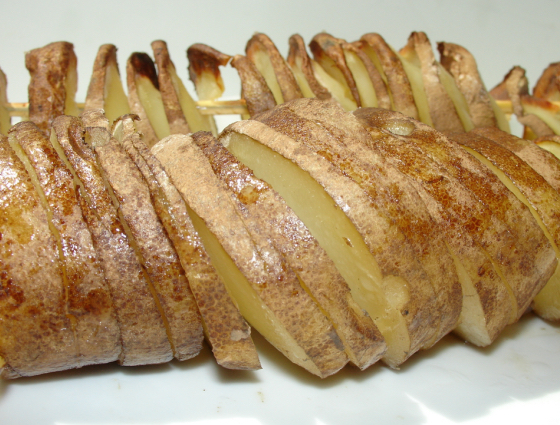 Actually I have an apple peeler that cuts in a spiral, and if the potato was small enough it would work perfectly. I'll have to give it a try! I had a similar thought. I have a daikon cutter that makes a spiral. But I think it's not quite big enough for a potato. And then the skewer wouldn't be in it holding it all straight and nicely separated for cooking. I'll bet my granddaughter would love these! She's been a picky eater of late so maybe these will encourage her. I hope so, Peg. I wanted to pull them apart with my fingers. I can't imagine a kid who wouldn't want to play with them. Kind of a variation on hassleback potatoes. Yes. They are, Libby. And I can't believe that you're posting without problems! Yahoo!!! What fun! I can't wait to serve these just to see my guests' reactions. They're a fun change, Linda. Just be sure you get some seasoning in between the spirals. I LOVE THIS!!!!! What a fun idea for Summer. And, you really can go nuts with different types of seasoning. You absolutely can. I also thought about pouring a little melted butter over them before serving . . . 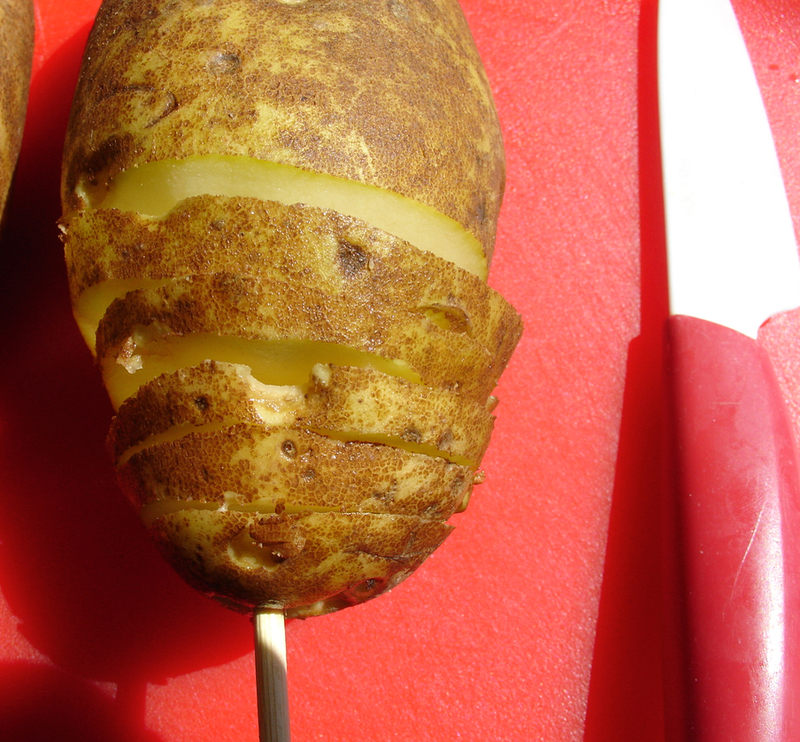 Potatoes are good, no matter how you slice them. Looks fun! I think everyone likes potatoes, Elaine! i was looking at them and thinking i would need some special tool. how cool is that. although i will have to use french fry seasoning or some other mix. cant have just salt alone. thanks for all the work! Kay, in a way, the special tool is the skewer. I was thinking that I wouldn't be able to cut all the way through, but it worked! Nicole, let us know what happens! I'm very curious. I think they would work if you close the top.